Conflict is the difference between individuals regarding their views, opinions and ideas. When different individuals work together in one setting, then a conflict is bound to occur. This is because every individual come from different background and possesses different skills and knowledge, and therefore they have separate views for every situation. These differences in opinion become a reason for conflict (Nye & Welch, 2014). However, conflict can incur both positive and negative results. Positive conflict is the way that a productive output is gained from the conflict that arises among the people in a situation. The different ideas and views could be beneficial for the situation and could establish different solutions which are creative in nature and will generate innovation business and increase communication among the people who are working together. Positive conflict can also help to build strong connections and relationships between team members. On the other hand, the negative conflict would not derive any productive results. There can be various issues between team members and a strong difference of opinion which might become a problem in the setting that they are working in. This creates many negative impacts on the team members such as frustration, intense competition among the team members, an increase in the stress of the people and resentment between the members of the team. There are many another kind of conflict and reasons due to which conflict arises. This report will help to understand the different symptoms of conflict which will help to get a deeper understanding of the process of conflict and how it can be determined. The report will also discuss the causes of conflicts and provide various solutions which can help to resolve the conflict. 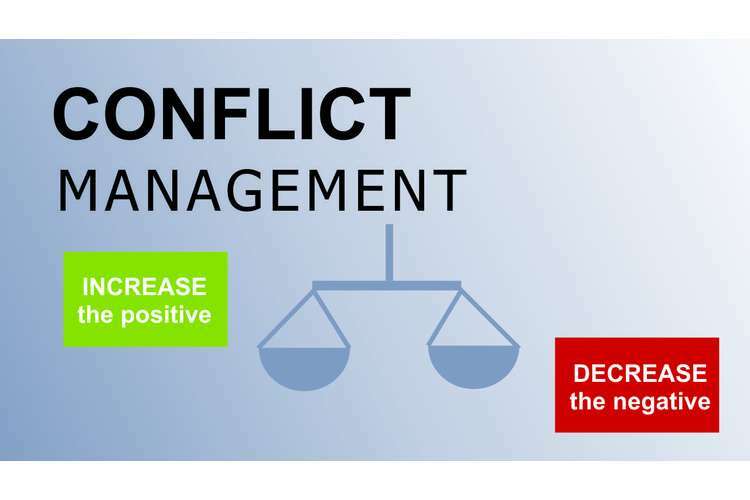 Several theories which are related to the conflict are discussed in this report to gather a better understanding of the concept of conflict management. Conflict is understood in the way if framed and defined in the process. There are general conflicts where the different parties have different opinions and views. The quality and characteristic of each conflict are different. Conflicts can be classified as symmetric or asymmetric. Symmetric conflicts are those where similar parties have a conflict of interest such as two employees or two friends. Asymmetric conflicts are those where a conflict of interest is present between two dissimilar parties such as between the employer and the employee or master and servant. In these conflicts, the one at the top level is the one who wins in most cases. A different characteristic of conflict can be realistic or no real conflict. The main difference between realistic and unrealistic conflict is the outcome of the conflict. Realistic conflicts have a fixed outcome whereas unrealistic conflicts do not. Realistic conflicts are easily resolved as long as the main intention of the conflict is solved. Conflicts such as these arise in the claims made for power, resources and position. Whereas, unrealistic conflict are mostly hostile in nature and could create grave tensions among the parties and the conflict could go on for a long period of time. Moreover, the conflict might not get the desired outcome at all. The third characteristic of conflict is a protracted conflict. These are the conflict which stays for a long time, even for generations after generations. These are the conflicts which occur in politics or religious factors. These conflicts do not have any fixed solution or way of resolution. Many internal and external factors influence these situations such as the conflict between China and Tibet. There are different forms and structure of conflicts. Certain types of conflicts are individual conflicts, class conflicts, economic conflicts, environmental conflicts, social conflicts, religious conflicts and international conflicts (Folarin, 2015). Individual conflicts occur between two or more individuals when they share different ideas with each other. Aggression and frustration can become one of the major reasons for individual conflicts. The aggressive behaviour in human beings is because of the frustration that is caused in their life which becomes a reason for conflict. Moreover, bad social conditions also affect the thinking process of an individual and hence individual conflicts emerge. Class conflicts occur when one group exploits another group because of the superior position of one group over the other. This conflict occurs as the superior group wishes to bend the other groups to their will and dominate their own views, interests and thoughts over the others. From the Marxist point of view, class conflicts occur due to material interests. In the capitalist society, there are two types of identified groups which are the business class and the working class. The business class are the people who own the capital and the resources which are needed for production. The working class people are the ones who provide labour to make the production. For centuries. The business class people have dominated the working class people which has led to class conflicts as the latter group of people have protested against the exploitation done by the former. In current times, this kind of conflict is still existent as people who work are often dominated by the management and this gives rise to class conflicts. Economic conflicts are the most common kinds of conflicts in recent times. They arise due to the problems that are existent in the society and the world. There are different reasons for economic conflicts such as poverty, dissatisfaction with life, non-availability of proper goods and services which leads to frustration among people and leads to conflict with one another. Poverty is the most common cause which leads to conflict as many people are still living in poverty in many countries especially in rural areas. Poverty is found in people who are unemployed, lacks proper nutrition, no savings, not able to provide the basic health and education needs of their children and no proper housing facility. These factors cause dissatisfaction among the people and lead to huge conflict with the government and also between one another. Environmental conflict arises due to the degradation of the environment because of the use of modern technology and the growth of industries in the world. The environment has been badly affected giving rise to pollution and thereby harming the nature as well as the lives of the people. Conflicts arise when people suffer due to the harmful effects of the pollution that is caused by industries. Environmentalists often produce conflicts with the industrialists to stop the harm that they are doing to nature. Social conflict arises when two or more individuals have goals which conflict with each other. Social conflict is often caused when two or more individuals have different views regarding various social issues. For every social issue that occurs it is inherent that every individual will have different views. This becomes a cause for conflict and could cause strain between the relationships of different people. Religious conflict arises among people of different religions and religious views. This conflict has been existing in the world for centuries and is still existent among different religious groups. Many religious leaders take the opportunity to create conflicts among people in the name of religion and the common people fight with each other in the belief that their religion is superior to the other (McGarry & O’leary, 2013). International conflicts arise between different countries and can result in wars where millions of people might get killed. Conflicts arise due to many reasons among people in a workplace or any other setting. Due to the nature of human beings and the different personality traits that they possess, the views they have there can be clashes among them. Conflicts can also occur in the workplace if there is a rivalry between two individuals, two groups or even between the management and the workers (Sherif, 2015). The lack of trust and bond becomes the reason for a major conflict. The signs and symptoms of conflict are often visible to the other people, whereas some conflicts are harder to identify and spot. However, it is required that the conflict is stopped at the initial stage so that it does not increase and give rise to something drastic within a setting. It is required that the conflict signs are identified and the real issue is addressed so that the team can work well together and give good productivity. Rupesinghe, Sciarone and van de Goor (2016) state that any organisation or work would be able to function properly if the team members are willing to work in harmony with one another without any negativity within themselves for one another. In such cases, the productivity is also high and the level of creativity increases making the work beneficial. The organisation will be able to run smoothly once the conflicts are resolved or stopped at an initial stage. Even though conflicts should be resolved properly, it is better to stop it before it starts as conflicts cam damage a lot of things including the relationship between people. Overton and Lowry (2013) state that once a relationship is harmed it becomes difficult to take it back to the old state even if the conflict is stopped. So the signs of conflicts should be identified and the conflict should not be allowed to start at all so that no damage is done between the people and the environment of the workplace. The different signs of conflict which can become an underlying cause are as follows. Firstly, anger is a major reason for conflict among the people. This is caused when people are upset in any situation and choose to overreact on another person without the fault of the latter. This creates a conflict among the two individuals which can escalate if not stopped initially. Anger can also be caused due to the derogatory remarks that are made towards one another in the workplace which can make people upset and angry. This creates a distance among the different individuals in the workplace ad they tend to either harm each other or avoid each other in work. Both of the ways would not beneficial or productive for the organisation if the individuals ever had to work together on any project. Secondly, inappropriate forms of marketing communication among the people in an organisation can be a symptom of a conflict. This often happens between the managers and the employees, when the former behaves rudely with the latter sue to any issue regarding work. The employees might be dissatisfied with the behaviour of the managers and slowly this can become a cause of conflict. Rudeness towards the employees or disregarding their opinion is a major issue in any workplace. Zia and Syed (2013) propose that thirdly, politics within the organisation is also a huge reason for conflict. This is the most common reason which exists in almost every organisation. Discrimination, undue attention are reasons which become a reason for dissatisfaction among many employees. This occurs when employees who are working hard are not appreciated or rewarded properly in the way that they deserve. This makes the employee demotivated towards their work. Every company needs to appreciate their employees so that they are motivated to work harder. It also happens that people who do not work as hard are often paid extra attention due to the personal relationships that they might have with the management. When this happens for a long time without any change, it causes a huge conflict and also a loss of manpower within the organisation. Fourthly, a slowdown in the productivity is also a huge symptom for workplace conflict. If the management sees that the productivity of their organisation is decreasing with time, then they should pay attention to the employees and the issues they might be facing. The improper environment in the workplace can be a reason for lower productivity as the employees might not feel motivated to work in a setting where they are not being able to concentrate on their work. There can be various reasons for this and it is important to pinpoint the actual reason so the management can solve it. Lastly, groups in the workplace is also a reason for the conflict in the organisation. There might be a certain group in the company ho might dominate the other individuals and work on the projects together. If this happens, the other employees would not be able to show their knowledge and skills to the management and therefore not grow within the organisation. This can slowly give rise to conflicts from the people who are not able to showcase their talents and develop themselves because of the dominance of the group. This should be stopped by the management so that every employee gets equal opportunity. These are the different underlying cause along with the symptoms of conflicts. There are several other symptoms but the ones mentioned are the most common ones. These symptoms should be identified at an early stage so that they do not become a cause for conflict in the workplace. Conflict resolution is the way that two or more parties identify a way that they can solve their conflicts and disagreements by finding a peaceful solution. The conflict can be due to various reason but it should be resolved quickly so that no permanent damage is done. Spaho (2013) state that conflict needs to be solved so that they do not escalate to a high level and affect the relationship between different individuals. There are many different solutions or ways to resolve the conflict. Firstly, the negotiation strategy is used which is the most common solution for conflict resolution. According to Kaufman, Honeyman and Schneider (2017) negotiation is the vehicle which can address the conflicts is a non-violent manner. This solution is used when the individuals have both common and different views of a situation. In such cases, a common ground is reached where both the parties can be satisfied with the result. Secondly, the superior goal strategy is used which means that the main purpose of the conflict is determined and the best solution is derived irrespective of the difference in ideas. Thirdly, third-party intervention is used where another individual gets involved in the conflict process with the aim to reach a final decision and to break up the conflict. These are the basic solutions for the resolution of conflict among many others. Moore (2014) proposes that the goal of these resolutions should be to produce a solution which will be agreeable to all the parties and to not permanently damage or hurt the relationship that existed among the parties. Chang, Luo and Zhang (2018) further argues that even though the goal of third-party intervention is to reduce or eliminate the conflict in an unbiased manner, however, all third party interventions do not have the same goal and many take part in resolutions as they might have their own interest in mind. However, no matter what the reason these people has a huge part in the resolution of conflict. There are different solutions and stages of conflict resolution which are as follows. Firstly, understanding the conflict is very necessary. The different reasons because if which the conflict has emerged should be first determined to solve it. The person who is resolving the conflict should also determine their personal interest in the conflict is resolved so that the conflict is solved properly. Along with the personal interest, the interests of the parties should also be determined so that it becomes easy to solve the conflict. Once the interest is found then they will be able to solve the conflict easily as the main reason for the conflict will be identified. Secondly, Olaleye and Arogundade (2013) state that proper communication with the opposition is important. If communication is done directly among both the parties then it can open many ways for solving the conflict. Without any argument, the parties should peacefully communicate with one another and listen to each other’s views so that they are able to understand what the other is saying. During conflicts, it is hard to listen to the other as each party is determined to prove their dominance over the other. Hence, it is important that they talk without any arguments so that they can reach at one common point where they both can agree. Thirdly, develop proper ideas to find that common ground which can stop the conflict from rising further. During the communication process of the parties, the third party who is resolving the conflict should brainstorm and find solutions and ideas which can stop the conflict between them and everyone can move on peacefully. For this certain rules have to be established for both the parties and the parties have to be willing to solve the conflict. If the parties are not willing them no amount of work will be able to solve the conflict. The main purpose has to be identified and the issue on which the conflict has started has to be determined. There could be many ideas which are found during this process (Leidner, Castano & Ginges, 2013). Fourthly, choosing the best idea is important to stop the conflict. The best idea would be the one which is agreeable to both the parties and respects both of their views and opinions. Even though the way that a conflict has to be solved in the same way, the solution for each conflict would be different depending on the type and the intensity of the conflict. Not every conflict can be solved by simply communicating with the parties. Sometimes communication could lead to more intense conflicts. Conflicts which are related to values can be solved by convincing the parties regarding the values and finding the common values of both the parties (Beardsley, 2013). The main problems should be approached which is the reason and even if the parties disagree with each other, they should be respectful towards each other and each other’s values. Disagreement should not lead to conflict as every person is bound to have individual opinions. Understanding and acceptance of each other’s view is the best solution which can stop the conflict among people and reduce the tension that is evident between them. Therefore, for every conflict, it is mandatory that the result is a peaceful agreement among all the parties and that the main reason for the conflict has an answer which is accepted by the parties. Hence, it can be concluded that conflict is formed when there is a difference between two or more people due to many reasons. There are many reasons for conflict which can create a damage to the relationships of people. The different types of conflicts are individual conflicts, class conflicts, economic conflicts, environmental conflicts, social conflicts, religious conflicts and international conflicts. These conflicts have different characteristics and therefore the intensity of the conflicts are also different. However, no matter what type of conflict arise it is necessary that the conflict should be stopped at the initial stage so that it does not become a huge issue. In a workplace, it is mandatory that the conflict is resolved and the symptoms are identified so that a peaceful environment is ensured in the workplace and all the employees can work together in a calm setting. However, if the conflict does arise and becomes huge, it should be resolved so that the individuals do not hold any grudge against one another in the future. A common ground should be reached so that none of the parties that have been present in the conflict receive any permanent damage or loss of people or peace. Therefore, no matter how big the conflict, the problem should not be expanded and solved as quickly as possible so that everyone can go back to their old stage. The right strategy and solution for conflict resolution should be determined for the proper environment in the workplace and gain more productivity in the organisation. The decisions made should be able to finish the conflict altogether so that nothing occurs in the future based on the same reason. 1. Beardsley, K. (2013). Using the right tool for the job: Mediator leverage and conflict resolution. Penn St. JL & Int'l Aff., 2, 57. 2. Chang, Y. M., Luo, Z., & Zhang, Y. (2018). The timing of third-party intervention in social conflict. Defence and peace economics, 29(2), 91-110. 3. Folarin, S. F. (2015). Types and causes of conflict. Types and Causes of Conflict, 1-12. 4. Kaufman, S., Honeyman, C., & Schneider, A. K. (2017). Should They Listen to Us: Seeking a Negotiation/Conflict Resolution Contribution to Practice in Intractable Conflicts. J. Disp. Resol., 73. 5. Leidner, B., Castano, E., & Ginges, J. (2013). Dehumanization, retributive and restorative justice, and aggressive versus diplomatic intergroup conflict resolution strategies. Personality and Social Psychology Bulletin, 39(2), 181-192. 5. McGarry, J., & O'leary, B. (Eds.). (2013). The politics of ethnic conflict regulation: Case studies of protracted ethnic conflicts. Routledge. 6. Moore, C. W. (2014). The mediation process: Practical strategies for resolving conflict. John Wiley & Sons. 7. Nye, J. S., & Welch, D. A. (2014). Understanding global conflict & cooperation: intro to theory & history. Pearson Education. 8. Olaleye, F. O., & Arogundade, B. B. (2013). Conflict management strategies of university administrators in South-West Nigeria. Kuwait Chapter of the Arabian Journal of Business and Management Review, 2(6), 96. 9. Overton, A. R., & Lowry, A. C. (2013). Conflict management: difficult conversations with difficult people. Clinics in colon and rectal surgery, 26(4), 259. 10. Rupesinghe, K., Sciarone, P., & van de Goor, L. (Eds.). (2016). Between development and destruction: an enquiry into the causes of conflict in post-colonial states. Springer. 11. Sherif, M. (2015). Group conflict and co-operation: Their social psychology. Psychology Press. 12. Spaho, K. (2013). Organizational communication and conflict management. Management: journal of contemporary management issues, 18(1), 103-118.